This is a simple guide that hopefully will give you an insight into your caravan and tow car electrical systems. This guide has been written in response to some of the questions that have been asked on various forums. It describes the electrical systems on a typical caravan and how they work. However, as caravans have evolved to the demands of the modern caravanner, these systems have become more complex, but a basic understanding of a simple system will help you diagnose faults even on complex systems in a modern caravan and help to maintain your caravan over the coming years. I have assumed you have no knowledge of caravan electrics, so I’ve started at the beginning and with a bit of history. Apologies to those reading that have some knowledge and find the early part a little simplistic. I have described a generic car and caravan wiring system, it will not be identical to your car or caravan. Each caravan manufacturer will have adapted a basic system to allow for more features and to take into account more complex requirements from its customers. A modern caravan has basically three electrical systems on board. Two of these systems are 12 volt Direct Current (DC) just like your car and the third is 240 volt Alternating Current (AC) just like your house. The first system is to provide the lights that replicate the road lights on your car. The second system is designed to allow 12 volt lights and accessories to be run from a battery in your caravan and finally the third system is designed to allow you to plug in to a 240 volt socket on a caravan site and allow the use of the same equipment you would normally just plug in to a socket at home. This is commonly known as EHU… short for Electrical Hook Up. The first and oldest electrical system on caravans, that was installed way back when most caravan’s were no more than small garden sheds on wheels were the rear lights that replicated the rear lights of the towing vehicle, usually no more than two side lights and two brake lights. Illumination for inside the caravan was provided by gas lights fed from a small gas cylinder usually clamped to the “A” frame of the caravan. It wasn’t long before the lighting system needed to be upgraded, as direction indicators became mandatory on cars, additional wiring was needed to replicate indicators on the rear of the caravan. Skip forward a few years and a rear fog light became mandatory, so a further upgrade was made to the lighting electrical system to allow the rear fog light to be installed. The wiring for these lights was connected through a 7 pin plug to the car that is commonly known as a “12N” connection. Sometime in between the indicators and rear fog light changes, people decided they wanted to replace the gas lights inside the caravan with 12 volt lights that could be run from the car battery. People often used old car spotlights or other 12 volt lights that were found in cars of the time as interior lights and these soon drained the car battery, so an “upgrade” was to install a second battery in the caravan that could be used to provide power for lighting. These were usually old car batteries. It would be another few years before the dedicated “leisure battery” came along. Originally, you would have to take this battery out of the caravan and charge it at home using a standard car battery charger. Again, in a continual developing process, someone came up with the idea of being able to charge the second battery in the caravan from the tow car while driving along the road, or when on site, being able to run the engine of the car and using a long lead be able to plug the caravan into the car to charge the battery for the next nights use of the lights, So a second “supplemental” electrical system was born and the “12S” (S for supplemental as to differentiate it from the 12N or Normal) connection came into being. The 12 volt systems are split into two. The first, and as we have seen, the oldest is the caravan road lights, that is to say the lights that are required by law to have on all trailers. These lights consist of “tail” or “rear” lights – rear side lights (red), brake lights (red), direction indicator lights (orange), reversing lights (white) and fog lights (red). Due to the size of a caravan front marker lights (white) are required and from 2013 side marker lights (orange) on longer caravans. These lights are connected to the car via a 7 pin “12N” type plug or by a more modern “continental” style 13 pin plug. The road lights are usually a complete system with all the supply and earth connections being separate from any other electrical system on the caravan. One of the most common faults with road lights is problems associated with the earth lead, but more of that later. The only road lights that are not connected via the 12N connection are the caravan’s reversing lights. The original 7 pin socket when it was developed was thought to have enough connections for everything anyone could ever want. Unfortunately as the years progressed, the number of “spare” connection on this plug diminished, to the point where there was no spare connection for the reversing lights. However, with the advent of the 12S, this was taken care of. • It must be able to charge the caravan’s leisure battery only when the car battery is fully charged and the engine is running. • It must be able to power the caravan’s fridge – but not allow the fridge to flatten the car battery if the engine is not running. • It must be able to power the internal 12 volt electrical system of the caravan, but turn everything off when the engine is running. • It must not interfere with the correct operation of the road lights of the caravan or towing vehicle. A simple connection from the car battery to the leisure battery in the caravan achieves this, but there are problems with this type of connection. If the car battery is flat and you try to start the car, a heavy current will be drawn from the caravan’s leisure battery and would cause the caravan wiring to over heat and possibly cause a fire. It would also damage the plug and socket connecting the caravan’s wiring to the car, as they are not designed to take the high currents involved in starting a car engine. So how can we do this safely? The charging circuit from the car is connected to the caravan’s leisure battery via a relay installed in the caravan. This relay is often referred to as the ‘habitation relay”. Simply it operates if it detects the car engine is running by sensing a voltage on Pin 10 (13 pin connection) If there isn’t a voltage present, the leisure battery is connected to the caravan’s systems and the charging circuit from the car is disconnected, however as soon as it detects a voltage on Pin 10, then it disconnects the caravan leisure battery from the caravan and connects it to the car’s charging circuit. For a full explanation read Understanding the Leisure Battery Charging Circuit. The installation of the ‘habitation relay’ makes the caravan comply with current European regulations regarding interference with vehicle safety systems. As a fall back safety system, the caravan manufacturer will install a fuse between the caravan’s leisure battery and the 12 volt systems on board the caravan. This does two things… it protects the caravan’s 12 volt electrical system if there is an overload or fault, the second thing is does is protect the caravan wiring from damage if the habitation relay should fail and you start the tow vehicle’s engine with the caravan connected. The fuse will blow before any damage can be done by the car attempting to use the leisure battery as a source of power. This fuse is typically rated at 15 or 20 amps. “It must be able to power the caravan’s fridge – but not allow the fridge to flatten the car battery if the engine is not running”. How do we do this? Actually its quite simple. A separate lead from the car battery to the 12S socket (or 13 pin socket) has a relay connected in line with it. The relay is controlled by the ignition switch, so that only when the car’s ignition switch is on and energising the relay, is the voltage from the car battery “turned on” to the relevant pin in the 12S (or 13 pin) socket. The cable that connects this circuit MUST be 2.5 mm diameter as it will carry a relatively large current. The earth path for this circuit is kept separate within the caravan and only earthed within the car. This is to ensure that the circuit is not connected to other circuits and to make sure the higher current required cannot be fed through other devices if a fault should develop. You will find out shortly why each caravan 12 volt system has a separate earth cable only earthed when it is connected to the car. It’s not a split charge relay….! Now this is not a ‘split charge relay’. It is a simple switching relay controlled by the ignition light circuit on the car or by the car’s ECU to switch on the heavy current feed to the fridge circuit. A lot of people call this the split charge relay and it’s not, you could call it the “fridge relay” if you wanted!. A “split charge relay” or “voltage sensing relay” was originally designed for vehicles with dynamo’s or early limited output alternators and detected when the vehicle starting battery was charged by the voltage output of the dynamo or alternator. When the starting battery was charged, the voltage rose to 13.6 or 13.8 volts and the relay switched the output of the alternator over to the second battery so it could be charged. If the voltage of the starting battery fell below a pre determined level, the split charge relay would switch back and charge the starting battery again. On some of the more expensive voltage sensing relays you can adjust the voltage. only want to power the fridge when the engine is running so we would not flatten the car battery when the engine isn’t running so we switched the fridge circuit “on” with the ignition… well in the caravan, the habitation relay senses the fridge circuit being turned “on” and when it detects this, it turns “off” so turning off the power to the internal 12 volt services. Why should we want to do this? Well, there are good reasons. With the increasing complexity of car electrical systems and the fact that modern cars are now controlled by computers, especially things like ABS, Engine ECU’s, Traction Control and Airbags in order to make sure these systems are not compromised by anything electrical in the caravan, the habitation relay turn all the caravan’s systems off with the exception of the fridge circuit and the caravan’s road lights. This is why the earth’s for these circuits are kept separate. It also ensures that the caravan leisure battery cannot supply any voltage to the towing vehicle for starting the engine. “It must not interfere with the correct operation of the road lights of the caravan or towing vehicle”. The lighting system on modern cars has grown more complex over time. We now have sensors that can detect when a bulb is not working and some cars have a system called “CANBUS” which uses digital signals to turn lights on and off when the car’s ECU or “brain” detects things… like you applying the brakes for example. To make sure caravan road lights can work with all cars, a simple standard is adopted so that you can plug virtually any caravan into any car and all the road lights will work. In order to make sure this can happen, the road light system on a caravan is kept completely separate form the other 12 volt systems. Before we start…. What is the correct voltage 230 or 240? In the UK, mains electricity is currently required by law to be delivered at 230 Volts, within a tolerance of +10%/–6%, that is, within the range 253 Volts to 216.2 Volts. The value of 230 Volts is said to be the ‘nominal voltage’. So connecting your caravan in either the UK or Europe will be OK and for now, I’ll go on calling it 240 volts. The 240 volt system is exactly the same as your house wiring. It allows you to use the same appliances you do in your home and works in the same way. The 240 volt system is not connected directly to any of the 12 volt systems in the caravan. I’ll explain a bit more about that shortly. How do you get 240 volts in your caravan? Well you use a EHU or Electrical Hook Up lead. These leads are different to the ones you have in your house in so far as they use different connectors. The connectors are blue in colour and have a 16 Amp rating, one end will have a plug with three pins on it to plug into the EHU socket on the caravan pitch and the other will have a “line” socket or trailing socket that plugs into a connector fitted into an outside locker or in some cases under a special weatherproof flap installed on the outside of the caravan. When connected, this lead provides a 240 volt supply of up to 16 Amps. In the UK some caravan sites are limited to 10 Amps, and on the continent, this can be limited to 6 Amps or even lower. Note that in Europe, the connectors mat be different, not all have adopted the standard blue 16 Amp connections yet. When you connect up to the site electrics – sometimes referred to as “shore power” (from boating) or “ground power” (from aviation) you need some form of protection from faults. This is usually achieved by a device called a ELCB or Earth Leakage Circuit Breaker. Simply this is a special switch that looks at the current on the incoming wire (live) and returning down the neutral wire. If it detects a difference or it detects that some of the incoming current is “leaking” to the earth connection, it then switches off the supply. It can do this very fast… were talking milliseconds here which is far quicker than a fuse takes to ‘blow’. You can test the ELCB by pressing the little test button on the device. It should cause the switch to turn off when pressed. If is doesn’t TURN OFF THE ELCB MANUALLY, UNPLUG THE EHU CABLE AND DO NOT TURN THE ELCB ON AGAIN BUT GET A QUALIFIED ELECTRICIAN TO CHECK EVERYTHING IMMEDIATELY. From the ELCB, the supply is taken to several other little devices called MCB’s or Miniature Circuit Breakers. These are the modern equivalent of fuses. In fact the whole ELCB and MCB set up in your caravan is almost identical to the ‘consumer unit’ (fuse box) that is in your house, only on a smaller scale. Each of these MCB’s will supply either a number of sockets, the leisure battery charger, water heater, caravan heater etc. The only way the 240 volt or mains system is connected to any other electrical system in your caravan is via the caravan’s on board charger. This device is sometimes built into a box along with the ELCB and MCB’s… sometimes its a standalone box usually located near the battery. This charger is a bit more complex than the cheap car battery chargers that you can buy from your local car parts shop. 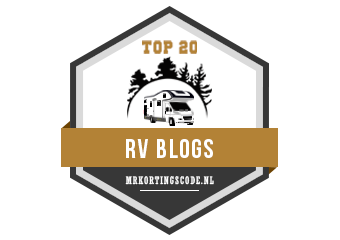 It has to do several things – firstly, it has to be capable of charging the leisure battery, second, it has to be capable of supplying enough current to allow you to use all the 12 volt appliances in the caravan… your water pump, interior lights etc. Some of the appliances that can be set to run on gas (dual fuel)….the water heater for example, still need a 12 volt supply for its operation. This is the same for your fridge and space heater when operating on gas. Remember, most caravan electrical systems are designed so the fridge will not run off the leisure battery… but requires that the leisure battery (or small 12 volt supply) is present to be able to operate of gas. The inbuilt charger also has to be capable of running all the 12 volt systems even if there isn’t a leisure battery connected. For electrical safety, the caravan’s chassis is connected to the 240 volt system earth. This means when you are plugged in to the EHU on your pitch, the caravan is safely connected to Earth, so should any fault develop it will trip the ELCB and you will be safe… even if standing on wet grass touching the metal frame of the caravan. This is one of the reasons the 12 volt neutral (sometimes called “earth” or “return”) is kept completely separate. easily put things back if you get stuck. Next, draw what you want to do and where you are going to connect the wires. Study the route of any new cables – is it possible to get the cables where you want them? Are the cables going to get trapped or damaged when the caravan is moving? If you are adding additional 12 Volt outlets (Cigar lighter or accessory type sockets) is the cable you are joining into of sufficient size to carry the additional load? Once you have decided what you want to do, write down a shopping list of things you will need. Wire – what length, rating and colour? Do you need any special connectors? Don’t ever consider using “scotchlok’s” (sometimes referred to as “IDC” or Insulation Displacement Contact) to splice into existing cables or lengthen cables. These connectors are unreliable as they rely on a metal blade cutting through the insulation and nipping the conductor inside the cable. They cannot be reliably installed and cannot handle more than one or two amps. A better way would be to solder the cables then cover the soldered joint with heat shrink sleeving, although, better than scotchlok’s, its still not the best way. Soldering takes a bit of practice and the transition point between soldered and un-soldered cable is a weak point. Soldered connections also suffer from oxidation. The best way of splicing or lengthening cables is to use crimped connections. You can buy a good ratchet crimp tool for £10 to £20 and will provide a lifetime of use. For the actual crimp fittings, you can buy through crimps for various sizes of cable (usually coloured Yellow, Blue & Red) that come with a heat shrink sleeve as part of the connector. The other thing you will need is a good pair of cable insulation strippers. All these tools and crimps can be found at places like Maplins. If you haven’t already got a simple digital multimeter, now is a good time to get one. It doesn’t have to be a ‘sooper dooper’ one, a simple one can be bought for under £10. (One of mine cost £4.99 from Maplins!) To learn how to make good crimp connections, there are lots of instructional videos on “YouTube”… just do a search on Google. If you are installing a new outlet, remember to include a fuse into the circuit. Generally, you always install the fuse as close to the battery or connection where you are picking up the positive supply from. The fuse is there to protect the cable from overload in the event of damage so its no use having it near the outlet if it gets damaged near the connection to the positive supply. Just because you are working on 12 Volts it doesn’t mean you can leave the battery connected! Leisure batteries store energy… that is what they are designed to do. Releasing this energy in a short burst if you get the wiring wrong will be spectacular, quick and dangerous! Batteries can and do explode, wiring can and will become red hot and you could lose your caravan. ALWAYS DISCONNECT THE BATTERY…. you have been warned! Well, you may have basic DIY skills and have already altered your caravans 12 Volt wiring, but unless you are familiar with electrical wiring and by that I mean more than just putting a 13 Amp plug on to the toaster, I would suggest you get a qualified electrician in. As most caravans are fairly simple, it will not cost too much to get the expert in. You can help keep the cost down by knowing exactly what you want to do, knowing where you think the cables could run and most of all, move anything from cupboards or lockers that would delay the electrician. Remember, If it took you 30 minutes to empty a locker so a cable could be run, you would have been paying the electrician to do that! DO NOT INSTALL ANY ELECTRICAL DEVICE, SWITCH, LIGHT OR OUTLET IN THE GAS LOCKER! It doesn’t matter if its 240 Volt or 12 Volt. DONT DO IT. That goes for joining cables as well, don’t join them in the gas locker. If you need to route a cable through the gas locker, make sure that it is well secured and cannot be damaged by the gas bottles and the terminations are well away from the locker. With a bit of thought, another route can usually be found that doesn’t involve routing through the locker. Calculating the load on your EHU supply. Most, but not all caravan sites have a rating of 16 Amps for their hook up point. So what’s the maximum load that you can use on a 240 volt 16 Amp EHU? V xI = P 240 x 16 = 3840 Watts. What can we plug in then? 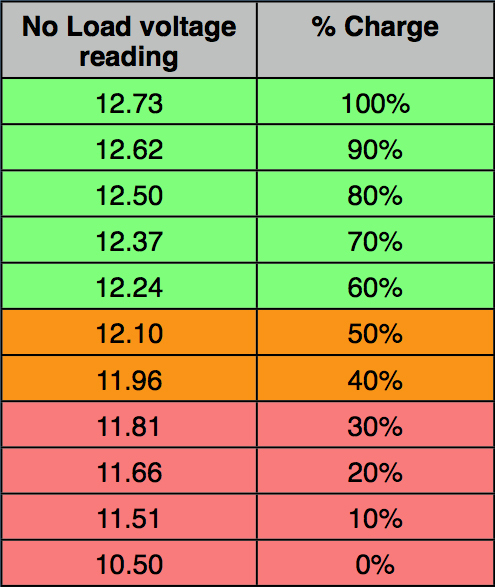 To work out what you can plug in, look at the data plate on the equipment and it should tell you the power rating…. a small toaster for example might have a rating of 800 Watts. So add up all the electrical devices that you want to have switched on and as long as the total comes to less than 3840 Watts, you are OK.
water heater and your caravan space heater, so if you have these on, you have to take these into account. To find out these ratings, look in the caravan’s handbook or check the manufacturers plate on each device. Now before you go switching on everything you own in the van, it is worth checking that the site supply is indeed 16 Amps. Some sites in the UK are only 10 Amps, in which case your total load can only be 2400 Watts. Continental sites can have a supply rating down as low as 6 Amps in which case your total load can only be 1320 Watts (remember, European supply voltage is usually 220 Volts… so you will need to take this into account when working out the maximum load). Calculating volt drop in cables. In order to calculate the voltage drop in a given length of cable, we need to know the resistance, current in the cable and volt drop for a known length of cable for each different the different sizes (cross sectional area given in mm2 for each cable used. Here is a simple table for the most common type of single PVC cable used and its size. How to work out the voltage drop. Voltage drop is expressed as milli volts per amp per metre. So lets look at that. Think of the brake lights on your caravan. We have a 1.0 mm2 cable connected to a battery that is 12 metres long that needs to supply two light bulbs that have a total load of 50 watts at 12 volts, how do we work out the voltage drop? Now we can use the following formula… Volt Drop x Current x length of cable and divide by 1000 (to convert mV (millivolts) into Volts). So in our example:- 38 mA/A/m x 4.1 Amps x 12 metres = 1869.6 mV divided by 1000 = 1.86 Volts. Now to complete our simple circuit, we also have a neutral cable (earth or ground) and have to calculate the voltage drop for this as well. As it is exactly the same cable and length, we also have a 1.86 volt drop. So when our brake lights work, they are working not at 12 volts, but at 8.28 volts (12 volts minus 3.72 volts). Maybe 1.0 mm2 cable is too small for this application then, so lets try it with 1.5 mm2 cable…..
so this time, the brake lights will operate with a voltage of 9.54 volts. This is a little better than before. So lets check that out…..
OK, thats getting better…. now we have a 0.73 volt drop on the neutral cable, a 1.23 volt drop on the positive cable…. so now our brake lights are working at 10.04 volts – definitely brighter! So each time the indicator lights up, the voltage drop on the return cable increases by 0.225 volts causing the voltage at the brake lights to drop from 10.04 volts to 9.81 volts, enough to cause a drop in brightness noticeable with the naked eye. Although this is a simplistic view of volt drop, it can be seen that the wrong size of cable can have consequences, and sometimes things don’t always work as they should as the voltage drop is too much. It is important therefore when altering any wiring on your caravan or car, you should always choose the correct size. If in doubt, always go a size larger. At this point, I have to throw a few other things into the pot. The connection between the caravan and car will also have some resistance and therefore a voltage drop, the earth point in the car may be slightly corroded, not noticeable in the operation of the car lights, but when you add up the voltage drop for the cable, the connection and the corroded earth point, you can now understand why your caravan lights may not be shining as brightly as they could or should be. How can we improve this situation? Well installing a 2.5 mm2 cable direct from the battery to the earth terminal in rear of the car where the trailer lights are connected to will definitely help. This is especially important if the charging circuit and fridge circuit also share the same earthing point. It may be worth going up to a 4 mm2 cable if you can. Making sure the earthing point is clean and not corroded will make a difference as well. One other thing to consider is changing the rear light bulbs to the LED type. LED bulbs manufactured for use in automobiles have a wider operating voltage from around 8 volts to 18 volts and will always be a full brightness between these voltages. A word of caution though. Any LED bulb used in a car or trailers road lights MUST have an EC marking on it. Some LED bulbs are only designed for show purposes and are not road legal. The reason behind this is some reflector designs rely on enough light being emitted in all directions in order to reflect off the interior of the light fitting. One of the requirements for vehicle lighting is not only the brightness of the displayed light but the surface area that is illuminated. Some LED Bulbs only emit light in one direction and nothing is reflected off the interior of the fitting. On the upside, to offset some of the voltage drop loss, when the engine is running, a cars electrical system usually operates around 13.5 to 13.8 volts and can be as high as 15.2 volts. To enable you to do this, you will need a digital multimeter. These are not expensive and small simple multimeters can usually be found for around £10 in electronic shops or big DIY stores. Set the multimeter scale to read 30 volts DC. With the caravan 12 volt electrical system turned off, place the red lead on the positive terminal (+ve) and the black lead on the negative terminal (-ve). Read the voltage displayed on the multimeter. To maximise the life of the battery, it is advised you never let the charge drop below 50%. Leisure batteries with a voltage of below 11.81 should only be charged with a 4 stage charger otherwise damage to the plates may occur. For the best charging performance when the leisure battery is not in use (over winter) look for a charger that offers a 4 stage charging process ( Bulk – Absorption – Equalisation – Float). For the most accurate results using this method of measuring the state of charge (SOC) the battery should have been rested for at least 6 hours – i.e not been charged or any load put on it. The use of petrol generators on most caravan sites is frowned on, mainly because of the noise. There are petrol generators that are coming on to the market that are extremely quiet, but a generator, no matter how quiet will quickly annoy you neighbours on a summers evening when all the windows are open and people are sat outside or in their awnings. However, at some events, the use of generators is increasing and at others, motor sport events for example, you will find nearly every team caravan has a generator running away in the background. A couple of important things to keep in mind when choosing and using a generator. If you are looking to buy one for the first time, always go for a 4 stroke engine, they are always much quieter. Also, always go for “Inverter Technology” generators, unfortunately they are usually two or three times the cost of a conventional generator, but you can plug almost any device into them and they will run your caravan 240 volt electrics without any problems. Cheaper conventional generators have very poor voltage regulation and could damage your caravans charging system or other components. When operating your caravan on a generator, you may get the reverse polarity light illuminating. This is because the generator “earth” is usually floating and the circuit that detects reverse polarity sees this and thinks that there is a problem. Always check your caravans handbook for advice about using a generator. A typical generator can only provide a fraction of the electrical power that you would have if you were on a EHU supply. Most Generators are around 2Kva or about 2000 Watts, which is equivalent to just over 8 Amps, so you will be limited to what you can plug in. Remember that your caravan’s leisure battery charger will take between 3 and 4 amps. If you are taking a generator with you, take it in the car boot. These are heavy bits of equipment and not really suitable for carrying in your caravan. If you want to know more about choosing and using a generator, read the “Understanding Generators” guide. Some additional generic wiring diagrams for you to download and print off. Car & Caravan Wiring – PDF Document with drawings for both 12N/S and 13 Pin car and caravan wiring. Voltage Drop on EHU Lead – quick reference chart to calculate the voltage drop on an 3183YAG “Arctic” grade 2.5mm2 EHU lead – in pdf format. 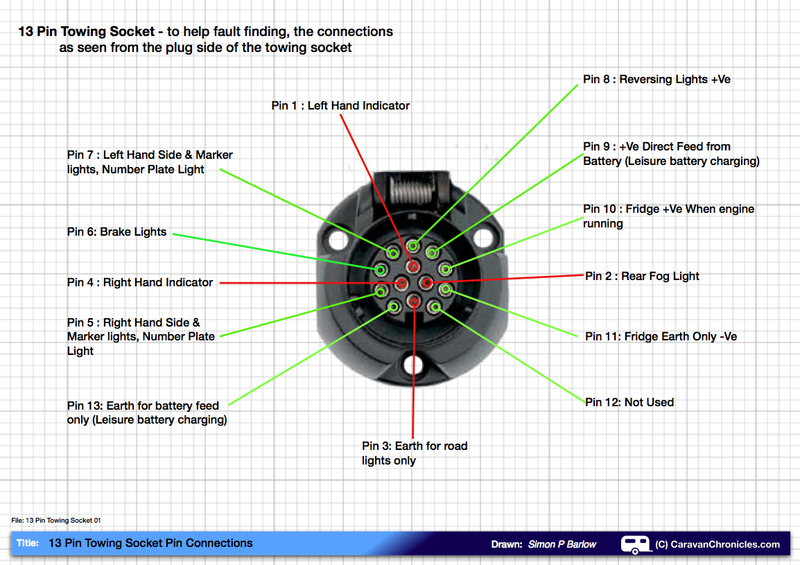 To help fault finding I have drawn out the pin connections for the 13 Pins towing socket as seen from the socket side, it will help identify which pins to check. The connections for a 13 pin towing socket seen from the socket (plug) side. Understanding Watts, Amps, Volts and Ohms – A very basic introduction to some simple maths that allow you to work out power, current and resistance. Relay, VSR, SCR… What’s the difference? – goes through the different types of relay that might be used to charge your leisure batteries. However, once the ignition switch is on the babitation relay connects caravan battery to car battery. At that point, if the van battery is very low, it could pull down the car battery and reduce its ability to start the car. Converesly if the car battery is low you will have the van battery trying to start the car nad hence blowing the fuse. the exact timing of “when the engine is running” would appear to be crucial here. How do you see those two scenarios? The habitation relay in the caravan is controlled by the power feed to the fridge circuit via pin 10 in the 13 pin connector. Pin 10 should only become live once there is an output from the alternator…i.e.when the engine is running, therefore the caravan battery can only become connected to the feed from pin 9 (permanent power connection) when the vehicle engine is running. Even if the ignition switch is turned on in the vehicle without the engine running there should be no output on pin 10 (fridge circuit) that could operate the caravan habitation relay. Therefore attempting to start the vehicle with a flat battery and it drawing current from the caravan leisure battery could never happen. As a safeguard, the caravan leisure battery usually has a suitably sized fuse (20 to 30 Amps) connecting it. Having just got a new BMW company car with factory fitted tow bar and electrics, I was mortified to find out that BMW do not connect pin 10!! After many arguments with BMW any getting offered to fit the extra pin for £680 I told them to “swivel” . So would it be possible to make an adaptor that connects pin 9 to pin 10 even if I have to manually for a switch? Any advice would be welcome as I have this car for 4 years.. I have just traded my Ford Kuga for a used BMW X3. Most people would think this is an upward move but I have to say that the Kuga is a far superior tow car than the X3. However. I too had a similar experience with the tow bar electrics and was quoted a similar price. Having looked at the X3 and clearly stated that I was looking at a car to tow my caravan, I was concerned to find that having paid for the car, it had only the basic electrics fitted. This is normal with BMW apparently. I broached the subject with the dealer who initially said they would address the matter. Later they told me that a conversion kit was required at a cost of £650. They were clearly not aware of this at the time of the sale.Rather than fall out with them I quietly explained that we were talking about a premium model marque and that I did not expect a basic fitment to a electric tow bar assembly that had already cost the previous owner £1500 as an extra.. Furthermore, as I had clearly stated that I wanted the vehicle to tow a caravan, they as a main dealer should have been aware that the electrics were not up to the job. On a modern caravan with the anti snake ATC system, the full electrics are essential. It’s not just a case of keeping the fridge cool. Quiet reasonable argument won the day and they fitted the upgrade kit at no cost. Lovely car but as a tow car it is no match for the Kuga which at £10k cheaper comes with a host of goodies that require expensive boxes ticking on the BMW order sheet. We pays our money and takes our choice. My van fridge (Dometic) has an auto selection circuit built into its fridge (permanently powered from the leisure battery in the van) that selects (in this preferred order) 1=240V, 2=gas or 3=12V from the tow vehicle. It will NEVER run the actual fridge from the 12V leisure battery, only the auto selection circuit is connected there. Also voltage sense is connected to the auto selection circuit (at D+); this is monitored for voltages above 12.5V to determine whether the tow vehicle battery/alternator is supplying enough for the fridge to be run (and automatically turns gas off when ANY voltage is present so that gas can’t be used when towing). Additionally I have a separate, red 50A Anderson plug circuit that provides the fridge 12V ‘on-the-road’ at connectors A & B. Furthermore I have a second, grey 50A Anderson plug after a voltage sensing switch to maintain the van’s leisure battery while towing. This bypasses the habitation switch. Notes – Dometic D+ = Dynamo sense, S+ = Solar sense. Anderson plugs only mate with the same colour and amperage plugs. Use a red Anderson plug for always connected and grey Anderson for only when engine is running. Other advantages of the Anderson plugs include – easy connection of a solar panel or an external battery charger to either battery (red into tow vehicle, grey into van). Easy connection of a 12V compressor or modified battery drill to either battery. As more and more vans are fitted with lots of 12V equipment these days I would recommend most contemporary vans should take the high amperage loads away from the ‘ordinary’ trailer plug and instead use a red Anderson connection direct from the tow vehicle’s battery to run the fridge and a grey Anderson connection after a voltage sensing switch to maintain the leisure battery while towing. 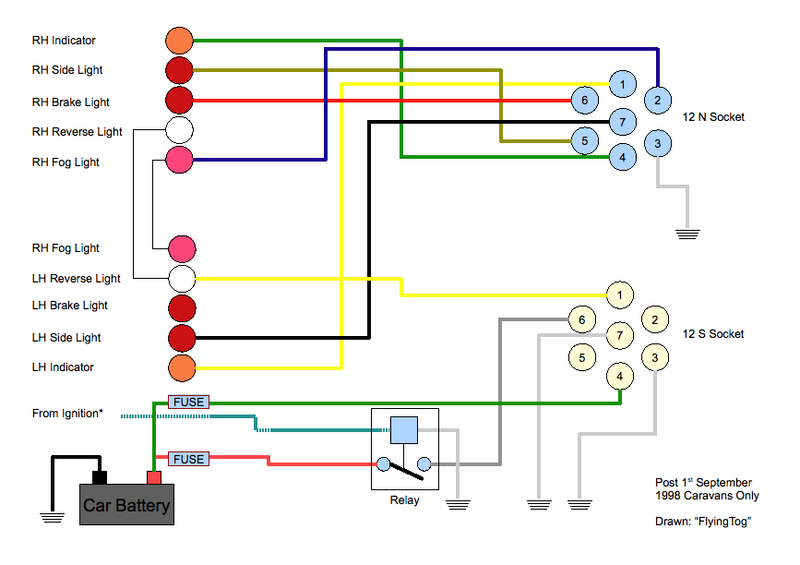 Simon, maybe you could add some diagrams that show auto sensing fridge power connections 1) through the 13 pin plugs and 2) via Anderson plugs ??? In theory using Anderson plugs to connect various circuits is fine, however in Europe the regulations state that there must be a system where everything 12 volt in the caravan is disabled when the tow vehicle engine is running – hence the habitation relay – except for the fridge circuit which is separate. The other downside of connecting the leisure battery directly to the tow vehicle battery via an Anderson plug is the fact that when starting, starting current can be derived from the leisure battery which are usually not designed to give high current output in short bursts. With modern tow cars, the trend is to let the vehicle’s ECU control the alternator rather than have a regulator built into the alternator. By using the ECU to control the alternator, when the vehicle battery is fully charged a short period after starting the vehicle, the field voltage is reduced therefore reducing the alternator output in order to reduce load on the engine, maximise efficiency and save fuel. When the ECU senses that a a circuit has been turned on (heated rear window for example) it increases the field voltage just enough to cover the new load requirements. Connecting a leisure battery directly to the vehicle battery would mean that once both batteries were charged, the ECU would still reduce the field voltage. Connecting the leisure battery via the tow plug the ECU become aware of it and changes it’s mode of operation. The 13 pin plug and socket is rated for 30 Amps for power circuits and as nearly all manufacturers fuse the fridge and leisure battery circuits at a maximum of 25 Amps… more often at 20 or 15, I can’t see any reason to convert to Anderson connectors. If you do a lot of off-grid camping and have 4 or more 100Ah leisure batteries in the trailer, then a second dedicated alternator and Anderson connectors would be perfect. At last this a common sense no nonsense response to a problem that’s haunted me for 3 years I now know how my electrics work and after reading this store of information it works thank you thank you thank you. A breath of fresh air to read a blog by somebody who knows what they’re talking about. Thanks for the article, I found it very useful being a new caravaner. Just one quick question. How would I build something in that uses the 240v supply to a/ charge my battery and b/ run my 12v system while on the mains supply. On the face of it, it seems simple to just build a device that can charge a battery and run a 12 volt system from the mains power. However there are a few considerations. To maintain the leisure battery in peak condition and expect any sort of life from it a three step charging system is the minimum that is required, six or multi-step smart charging would be even better. (C-TEK type chargers) For the 12 volt electrical services, consideration has to be given to limiting the voltage as if we use a multi step charger for the battery, the 12 volt system could be taken to a higher voltage than LED or electronic components such as TV’s, Aerial Amplifiers, Alarms or even LED lights are designed for. Therefore a 12 volt regulator would be required to cap the supply voltage to the caravan’s 12 volt system to a maximum of 12.5 to 13 volts no matter what phase the multi-step charger is at. So given all the above, a smart charger powered from the mains to charge the battery and a regulator between the battery and the caravan’s 12 volt system should take care of that. That is not quite the end of it though. If the battery is being charged by a smart charger and you turn on a tap requiring the water pump to run, the battery will now be required to provide current to run the water pump. The smart charger needs to be able to understand that the battery is now under load so it won’t upset the charging cycle and start to overcharge the battery once the load has been removed. SOme smart chargers may even see this electrical load as a fault with the battery and shut down for safety reasons. So we really need a device that has two outputs, a stepped charging output for the battery and a regulated 12 volt output for the caravan. When the mains power is removed the device needs to be able to allow the battery to supply all the current and when on mains, it needs to be able to run the caravan’s 12 volt systems while charging the battery and if the caravan’s 12 volt system’s electrical load exceeds the capacity of the regulated 12 volt output be able to allow the battery to provide energy for the extra electrical demand. If we throw into the mix the option of adding a solar panel that might supply energy either when hooked up to the mains or off the mains and the option to have a 12 volt to 12 volt charging system so that when being towed, the 12 volt charging supply from the vehicle is also fed to the smart charger so it can control and fully charge the leisure battery from the vehicle supply it starts to become a complex solution. I guess it would be possible to build a unit from scratch at component level by reverse engineering some ‘off the shelf’ modular parts. Many thanks that is a great help. My main concern was running the car in the site. I’ve not seen anyone else doing this and a car engine can be just as annoying as a quiet generator. I have 240v lights plugged in but on my first trip found that with the pump and heating working off 12v I was limited in what I could do. Your solution does answer this for me and I’ll be ordering the units I need shortly. I know some of the classic caravan restoration people use this unit http://www.leisureshopdirect.com/caravan/electric/product_33292/dual_stage_transformer-charger.aspx when adding 12 volt electrics to restoration caravans as it is small and light weight. I have dealt with Leisure Shop in the past and they are reliable people to deal with although I have no first hand knowledge of the product. I am looking into buying an old caravan with no electrics, do you know how much something like this would cost fix? Depending on what you actually want, just a 12 volt system so you have a battery and interior lights or if you want to include a mains system as well. A 12 volt battery, Mains Charger & Power Supply, Fuse and Circuit Breakers, EHU Lead socket and internal lights and sockets you would require should be around AU $550 to AU $600. (I’ve converted from UK prices) On top of this you will also have cable and installation costs. As it’s not had a electric system before, you will also need a battery box that can be installed and vented to the outside, sealing off the battery from the interior of the caravan. If it’s a vintage caravan that you want to retain as much originality as possible then it will probably take longer to install everything. I would suggest having a think about what you want and contacting a few local mobile caravan engineers and get a quote from them. You could try qualified electricians, but they may not be used to working on caravans and add a bit to their quote to cover them for the unknown. It might be worth checking out Vintage Caravan Magazine (based in QLD) http://www.vintagecaravanmagazine.com.au/ as they might have ad’s for companies that could carry out this kind of work and give you a quote. I’m not sure of the regulations in Australia regarding electrical installations in caravans but I think it has to be done by a qualified person. Hi Simon, while travelling across Spain I made an overnight stop and left the caravan connected to the car electrics I also hooked up to mains.The next morning the car battery was flat, I’m sure I’ve done this before with no consequence.All I can think is that european site wiring can be susspect. Not knowing the specifics about your caravan – make, model etc. I think I know what might have happened. In older caravans there used to be a switch, car-off-van that would allow you to manually select where you wanted to draw power from. In later vans this was dropped and I have a feeling that some electrical systems installed in some caravans make the assumption if the van is plugged into the vehicle that is where it draws 12 volt power from even if you are plugged into the site supply. The power supply/charger will still charge the leisure battery but the 12 volt power for lights etc comes from the vehicle. I have heard of this before but only anecdotally second or third hand and there were no details about the caravan make or model. I would be interested to know the details of your van as I’d like to look into this as really it could do with a bit of a warning if that’s the case. My caravan is a Bailey Senator California manufactured in 2009 so its not particularly old. there are no switches as such to choose a source of power. hope this info helps solve the problem I would be interested in your feedback. I’ll see if I can obtain a full wiring diagram for the caravan and have a look to see what might have happened. Usually the limiting factor is the size of the battery box. Most are designed to accommodate 110 Ah or 120 Ah batteries. The second limiting factor for caravans is the weight. The larger (and heavier) the battery, the less user payload for the caravan. It is possible to fit a second battery in parallel to increase the capacity for ‘off grid’ camping but this will require a second battery box installing within the caravan. Another option would be to have a second battery carried and charged in the two vehicle and swop it over with the main caravan leisure battery when that became discharged. Not 100% sure of electrical setup in a 2002 Bailey Ranger. The power for the fridge comes straight from the car when the engine is running. On some modern (less than 2 or 3 years old) cars, if it is a OEM towing bracket and electrics, the power for the fridge circuit is controlled via the vehicle ECU and sometimes there is a few minutes delay while the car charges up the vehicle battery before supplying power to the fridge circuit. This is more common on vehicles with a stop/start eco function. The next thing to check is if there are any fuses in the caravan for the fridge circuit and these are OK. Make sure the 13 Pin plug ( or the 12N & 12S 7 Pin plugs) are OK with a quick visual check. Caravans usually have either a car-off-van switch or a master switch to control the electrics. If it is a master switch, then this usually needs to be on for the fridge to work from the 12 volts supplied by the vehicle. If it is a 3 position car-off-van switch then check in the caravan handbook, but usually it has to be set to car. The interior fridge light is run from the caravan’s leisure battery and 12 volt system which is disconnected via the habitation relay when the engine is running, so it might not be an indication of the fridge running or not. The other thing it might be is the actual 12 volt element has failed. If the caravan has been used on EHU with no leisure battery, it it most likely the fridge has been used on gas for quite a while, so the 12 volt heating element could be suspect. You may not have to take all the steps detailed but it will give you an idea of the layout and where you could perform quick checks. Great article, help I have a problem. Have recently had towball and elect. fitted to x3 since then have message on car stating battery discharging when car is stationery. In boot there are two fuses. when both disconnected no problem. both in problem returns, Have taken one out problem seems to have gone. Next step? It sounds like there may be an earth fault on the road lights. If the road lights work all OK when plugged in on their own but not when you plug in the 12S lead, then the side light earth may be compromised but it might be worth checking the sockets on the tow vehicle as the caravan checked out OK separately. Do you know someone with a tow vehicle that you could connect your caravan up to and/or connect your tow vehicle to another caravan? You don’t say which fuse – road lights, fridge supply or battery charging supply or which earth cable is getting hot but I’d start by tracing and confirming the continuity for these earth’s for the three main circuits – road lights, fridge and leisure battery charging circuit. These three should not be connected in the caravan only connected inside the tow vehicle. Sounds like something is shorting to one of these earths. If no road lights work at all, it is probably down to the earth cable, as it’s the only cable that if not connected correctly would affect all lights. If everything was working correctly before the plug was changed, it’s highly likely that the plug is wired incorrectly. 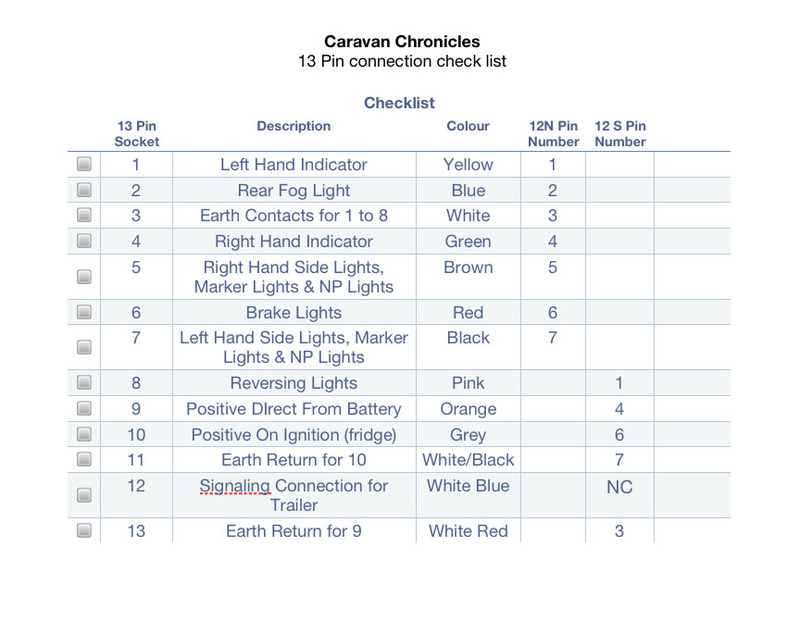 This chart (column 4) https://caravanchronicles.files.wordpress.com/2012/01/13-pin-connection-check-list.jpg has the correct pin connections for a 7 pin (12N) plug. The colours that you caravan has been wired in might not be correct as they did change over a period of time and from manufacturer to manufacturer. The first cable you need to identify is the earth. To check which this cable is, use a multimeter set for resistance (Ohms range) and check each cable in the plug to one of the earth points on one of the road lights. If you can’t get a reading on any of the cables, then the earth cable must have a break in it. Unfortunately it is not possible to run a fridge off a 12 volt battery for any period of time. Most fridges require around 15 amps and that wold flatten a battery in a few hours. They can only run off 12 volts while a vehicle engine is running. I would suggest that if you have just had the fridge serviced by a Gas Safe qualified engineer that you contact them as obviously the service was not correct and should have included testing for gas leaks, burner efficiency and CO2 emissions. Great article! My query is slightly different – not for a caravan. I have just got a new tow car with 13 pin socket [+ adapter to 2×7 pin]. I will be charging a trailer mounted leisure battery on a boat launch system which is direct wired to the 12S plug. There is no other 12v system connected and no control relays or fuse in line. Trailer lighting is on separate 12N lead [has to be removed completely for launch!]. I’m wondering if it would be better to connect to the ‘fridge circuit’ [pin 10] rather than the permanent live [pin 9] to ensure that charging can only occur when the engine is running with no risk of back current if car battery flat? Your advicewould be much appreciated. 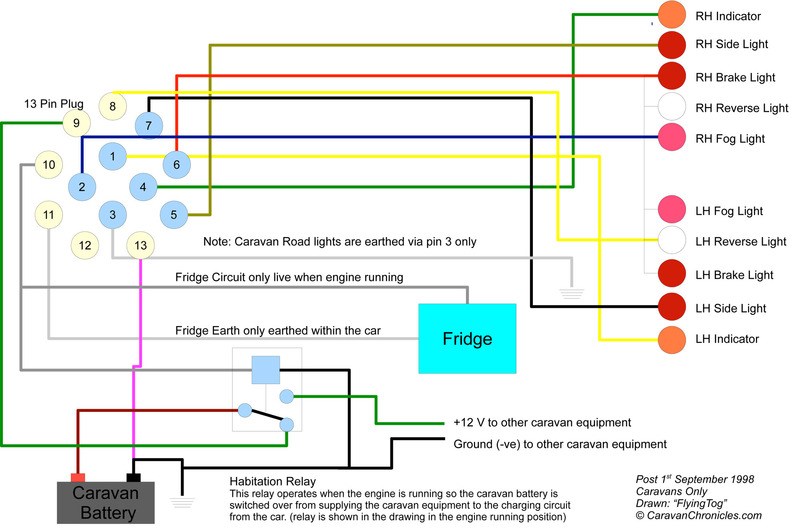 Using the caravan fridge circuit would be the most sensible option in my opinion . Many thanks for the help. I knew I’d have to modify as my [very] old car was charging through 12S pin 2. At least the new 13pin socket is fully wired up by the dealer. We have just purchased a Elddis Avante 515, year 2012 after a long time away from caravaning. The caravan is modern enough to have a charger for the 110Ah leisure battery whilst plunged into the mains electricity supply from our house. There is a caravan mover fitted to the caravan, and when it was delivered the caravan dealer used the mover to position the caravan on a separate drive adjacent to the house. One of our neighbours said that the motor mover would have used a lot of the leisure battery power, and that we would have to charge it back up, as the charger on the caravan internal circuit wouldn’t charge sufficiently enough. My wife, based on this knowledge bought a Ctek MXS 5.0 smart charger to charge up to peak power and to leave on trickle charge over winter. Can I connect the smart charger to the leisure battery with the caravan terminals still attached to the battery? If I disconnected the caravan terminals from the leisure battery would I loose the settings to the motor mover? Chargers installed in caravans over the last two or three years tend to be a lot better than they were. Most are now three stage chargers and will be up to the job of charging your leisure battery after using a motor mover. However, for the long term health of a leisure battery you can’t beat using a C-Tek charger. My preference for your situation of storing the caravan at home would be to disconnect the battery from the caravan charger and use the C-Tek while at home to charge, condition and maintain your leisure battery and reconnect the battery to the caravan when you are ready for a trip away. The inbuilt caravan charger is also a 12 volt supply and will quite happily run the caravan 12 volt electrics without the leisure battery while you are plugged into 240 volt services. There is no need to remove the battery from the caravan. PS… not sure if you would loose the settings on your motor mover or not as we don’t have one so I have little experience of the set up and configuration. Great article, but confused. com , advise please urgent. I have always had new car with factory fitted tow bar twin electrics however stopped caravaning in 2006 as shared with my parents. However last year changed my 2009 car for an ex show room demo car this being a 2014 plate . We have recently been looking at caravans ( 2nd hand as will only be using it for approx 4 weeks a year ) have booked the car in to have a towbar and twin electrics put on but today garage asked me if the caravan is a 7 pin or 13 pin ? As we haven’t yet purchased a caravan and cars going in on 15th June to have the work done what on earth do I tell them to put on the car ??? Please advise me ASAP many thanks vicky. A single socket with 13 pin electrics is now the standard and all caravans are now made with a single 13 pin plug on them. If you do buy an older (10 years) caravan with 2 x 7 pin plugs, it’s easy to ask the dealer to convert it to 13 pin as it’s a simple matter of changing the existing plugs over to one 13 pin single. Thank you that’s really helpful, would I still be able to tow my little trailer that we use for garden tip/ ( had used for tent camping trips )& my light board for the bike carrier , with the 13 pin ? Hi, my question is… I use an Anderson plug connector from my car to the caravan while towing and disconnect when I set up. Is the Anderson plug on the van a “current in only” or can I run 12vlt appliances from this connection with another Anderson plug connection e.g. outside 12volt lights or 12vlt pump for water. The Anderson connector is usually connected directly to the battery in the trailer and you can use it at a power point for powering accessories. However, as the connector is really designed for high current, it may or may not have a fuse in the circuit. If it does, it will usually be a high amperage rating. I would suggest not using the Anderson connector to power accessories and have a weatherproof 12 volt power socket installed protected by a suitably rated fuse for your accessories. The easy way to find out is if the socket works when the master switch is off then you can charge the battery with the master off. Personally I’d install a separate connector with a fuse directly to the battery so I would not have to remember to switch anything. Excellent article. The definitive guide to caravan electrics. Well done Simon. Great technical knowledge, here is an unusual question. My caravan has the dual controls for switching the battery being used/charged from car to caravan. if the car was electric/hybrid plug in would this huge battery pack be charged through the towing electrics? Quite simply the answer is no. Hybrid vehicle batteries are usually a lot higher voltage. What an incredibly deep and thorough explanation on the subject! After spending a couple of hours reading through your articles and 10 minutes disassembling my 13 pin socket I now understand why my fridge isn’t working (while all the lights function normally). Thank you for taking the time to put this down. Since in a car there can be only one Mass (the chassis), will it be safe to bridge 11 and 13 to pin 3 (which currently is the only connected mass pin in my socket)? It is not advisable to bridge any pin in the socket. The reason being, if you bridge the pins, there could be a failure of one of the cables going to the chassis, and if the pins were bridged, the remaining cables could not safely handle the current. It would also make troubleshooting difficult as you would not know if a cable had failed as everything would still appear to work but be potentially overloaded. I would take separate earth (return) cables from each pin back to a common ground point on the vehicle. To get the best performance from the leisure battery charging circuit and fridge circuit (less volt drop) I’d actually run these cables direct back to the battery. Copper is a better conductor than the steel chassis. Thank you for this great explanation in plain English which brings me right up to date with what to expect from modern caravan electric systems. I could not work out what was wrong with the caravan interior lights when I first backed up and plugged the 13 pin plug into the car whilst the engine was still idling !!!! Great explanation and diagrams . Many many thanks what an informative piece of work now know how to use fridge when travelling plus I can retain this very informative piece for future reference. Once again many many thanks. Really useful article, so thankyou. I have just joined the caravan world and bought a German built van with only EHU. It does not have a battery fitted, or anywhere to hook in a battery. The connection to the tow vehicle is 12N only. How do I go about installing a battery to the van so that I can run off grid when I want to please? How do I connect to the existing consumer unit to link up to the existing wiring in the van (with a 240V to 12V switch option). As well as the battery and charger do I also require an inverter or is this not required if I link into the existing consumer unit via the switch? Converting a German caravan with only EHU can be done but it’s not going to be an easy or cheap process. If you have a Hobby caravan, I believe Hobby sell a conversion unit and kit that allows you to fully integrate a 12 volt system into the caravans existing wiring and controls. I would suggest if you have a Hobby to go this route. I believe it’s around £1200 for the kit + installation. 1. Check to make sure the fridge can be run on 12 volt. If it can, you will then need to replace the vehicle connection lead with a 13 pin one and connect up to the existing road lights. (you will need to do this anyway even if the fridge can’t run on 12 volts to allow you to charge the leisure battery). 2. Find a suitable location near when’re the cable from the 13 pin plug enters the caravan and install a suitable junction box containing a habitation relay. This box will probably be a custom made piece of kit. 3. Find a suitable location and install a sealed battery box with outside vent. You will also need to consider what size battery you require… 120Ah is the biggest single battery generally available so going above this might require installing two battery boxes. 4. Find a suitable location and install a 240 volt leisure battery charger. 5. Find a suitable location and install an inverter. 6. Install the cabling for powering the fridge… you might need to remove the fridge to get to the connections. 7. Instal the cabling for charging the leisure battery from the vehicle. 8. Locate the installed 12 volt supply for the existing interior lights and isolate so you can install a 12 volt feed from the leisure battery. 9. Connect the leisure battery charger to the 240 volt services and to the leisure battery. 10 Connect the inverter to the leisure battery. For the mains side you will have to decide if you want a change over switch so that you can just simply switch the caravan from EHU to Inverter. If you go this route you will need to install a charger disconnect relay so the charger isn’t powered from the inverter. It’s a big project and a lot of time is taken trying to find the best place to locate nd install all the components. You need to draw out the circuit before starting anything and be sure how it all interconnects and make sure you have a few copies of the caravans original wiring diagram… you will be doing lot of writing on them! If you have electrical technicians experience it should take around 2 to 3 days to do and expect to pay around £600 to £700 for all the component parts (including battery) If you want to include solar panels…. decide now as this will make a difference in choosing the charger unit even if you don’t install solar now. If you have to get a qualified auto electrician to do all the work, expect to pay around £200 to £250 per day for a good technician. I have been involved in doing this upgrade and with the owner physically installing everything over a five day period, it took 2 days to connect everything and half a day testing.